The Tyee test fishery started on May 25th 2016. In order to keep the index values comparable between years the start date has been standardized to June 10th for all years. Please send any questions about the Tyee test fishery to Jeffrey.Radford@dfo-mpo.gc.ca . 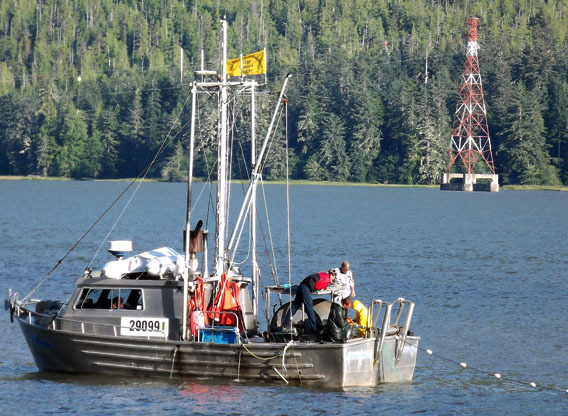 Gillnet test fishery operations have been conducted at Tyee in the lower Skeena River since 1955, in order to evaluate the magnitude of Skeena River salmon and steelhead trout returns. This program was developed to provide daily estimates of sockeye escapements through the commercial fishery. The data obtained from this operation, combined with estimates of the commercial catch in Area 4, provides a complete picture of the sockeye and pink runs as they develop each year. This information is considered essential for the effective management of all Skeena salmonid species. The estuary of the Skeena River exhibits the greatest tidal fluctuations on the Canadian Pacific coast. Tidal differences of over six meters, common during spring tides, generate tidal currents of three to four knots in some areas. Debris-carrying tide rips, unusual current patterns, and sandbars make the setting of a commercial length gillnet in the Tyee area a very difficult procedure. The net is allowed to drift within a channel measuring two to five kilometres long and 0.8 km wide that runs parallel to the northern shoreline of the river. The net that was used until 2002 in the Skeena test fishery is an undyed, fibrous nylon gillnet of 200 fathoms total length and 20 feet depth, made up of ten equal length panels of mesh sizes 3.5 inches to 8 inches. Starting in 2002 a new net has been used based on the popular 6 strand "Alaska Twist" net used by commercial gillnetters. Set times for the Skeena test fishery vary according to two parameters. The first of these is the tide height, i.e. the height of a particular tide above Chart Datum. The second factor is the discharge of the river. Spring freshets generally reach their peak in the month of June and taper off gradually throughout the summer. Sets are made on both high and low water slack during daylight hours. This usually results in three sets a day, but sometimes two or four can be made. Drifts must be exactly an hour long. Daily escapement estimates are calculated for sockeye salmon. Although they are not calculated for the other species (chinook, coho, chum, pink and steelhead), relative abundance and timing is determined by comparing the calculated indices for a given year to those recorded in previous years.